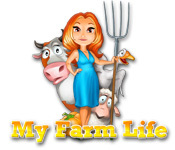 My Farm Life is rated 4.6 out of 5 by 21. Rated 5 out of 5 by gold111z from Greatest time management game! I play this over and over. Make more!! Rated 5 out of 5 by ktosch from Not challenging but fun and worth your $ Great game! The storyline is cute too. It is fun to play and has a lot of levels, one of the awards is to finish the game in a day, I don't know if that would even be possible! My only negatives are that it wasn't hard to finish levels with a gold, even in expert mode and there was no timer or warning to let you know when the gold time expires. I will definitely be playing My Farm Life 2! Rated 5 out of 5 by dianewright7943 from Very challengin'and addictive game! 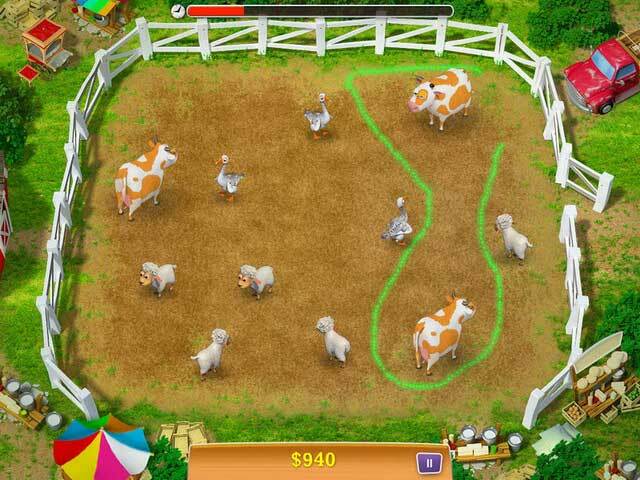 I've played FARM'LIFE 1 til I reached a very difficult level that seem impossible to complete. But just couldn't tear myself away from tha'game. Its very addictive. Rated 5 out of 5 by JeanieDM from Still working on it I love it when a game goes on & on......this is one that I couldn't just finish in 1 or 2 days so very worth the little cost/investment. Also, so many "episodes" to replay & get extra money for the future "episodes". I'm anxious to try #2! Rated 5 out of 5 by MomMontgomery from Way better than any other game i've played!! So challenging and fun!!! 2 is also great! can't wait for 3!! Rated 4 out of 5 by Cookie_Farmer from If It Wasn't for the RIDICULOUS "Thieves".... I am thoroughly enjoying the game EXCEPT the stupid "thieves". I don't know who thought that was a good idea but it absolutely is NOT. I feel like the whole game comes to a standstill while I wait for the night to be over because even though I bought the dogs... the thieves were still a super nuisance. Other than that, I really like the game. Rated 4 out of 5 by Peachkins from Well worth buying as a daily deal I just got finished with the demo on this one and promptly bought it. I have had a lot of fun with this one so far. Like several other time management games I've looked at recently, you are responsible for a farm. You buy, plant, and grow crops in addition to taking care of a variety of animals that will provide you with milk and eggs among other things I'm sure. There are various pieces of equipment that can turn these things into more complex products. Of course there are goals you have to meet in each level. 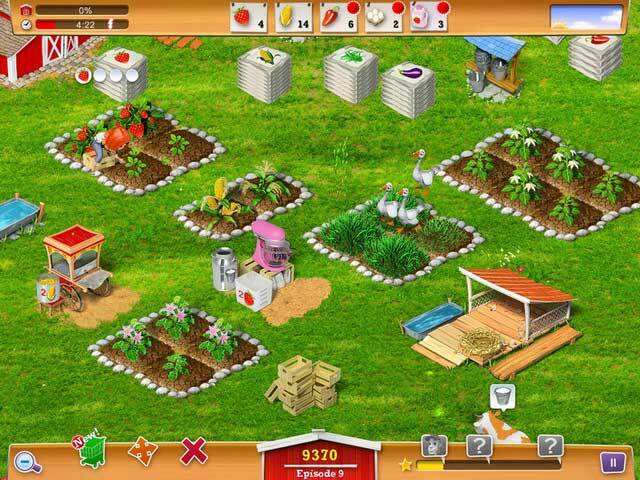 The game has an excellent tutorial that does a great job of explaining how the game works and also reminds you of things that you should be doing, like buying extra animals or letting you know different crops are available. As the game progresses you get access to assistants that can help you do things like water and harvest your crops. The upgrades you make on your farm carry over from level to level, and your farm grows in size as well. One thing I really love about this game is that you can choose to arrange your farm however you want. The layout is completely up to you, and you are able to move things around anytime you want. This comes in very useful as the size of your farm and your goals change. I feel that the game is adequately challenging. While I have been able to get expert on many levels, there have been a couple that I didn't, and one level that I had to replay completely. The storyline and graphics are very cute and definitely add something to the game. I recommend this game- especially if you can get it with the daily deal price. 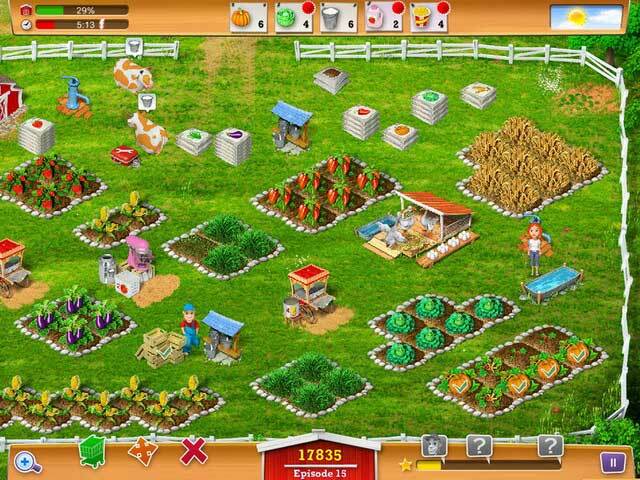 Rated 4 out of 5 by jaelannelucy from Life on the Farm This is a good farm management game! I enjoyed that there were mini games to keep it fresh! Rated 4 out of 5 by chuahrunping from chuah's farm this game is very funny, interesting. I like it very much because it can build up my patient. Rated 3 out of 5 by cowclaudia from Same-O Same as Ranch Rush, Hobby Farm and other games of this ilk - buy a plot, plant a vegetable, take to barn/market, milk the cow. Nothing really new. For those who like this type of thing fine - me bored after 20 minutes. Rated 3 out of 5 by jodybrissey from fun but really hard, some levels are impossible to pass this is a fun game, but there is a level that i can't pass, tried for a couple months. used the help, but no luck. disappointed.